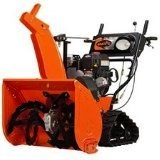 If you are living in area that receives massive amounts of snow, then you should consider something like the Ariens Deluxe Track 28 snow blower. Instead of wheels the Ariens ST28LET has a track system to give the user unparalleled traction and grip even in black ice conditions. This snow thrower is equipped with a Briggs and Stratton designed and built Polar Force engine that gives it enough power to easily tackle the most compacted snow and ice. To start this snow blower you can plug it in an simply press a button. But you may not be close to a plug socket, so Ariens have also included a recoil system with pull cord to start it as well. You are able to control the height of the cutting edge on the Ariens Deluxe Track ST28LET snow blower thanks to it’s adjustable and reversible skid shoes. This will help to prevent you from damaging the surfaces you are clearing. Once snow enters the ‘bucket’ area, it is immediately ground up by the 0.36 m (14 inch) auger that has been built from serrated steel. The auger also draws this snow towards the center where a steel impeller consisting of 3 blades, drives the snow out through the chute. It is capable of sending this snow up to 15.2 m (50 feet) away from the machine. The Ariens Deluxe Track 28 Snow Blower has 6 gears for traveling forward and 2 gears for when it’s reversing. This is provided by a Disc-O-Matic transmission that is housed in extra string aluminum. The chute on the Ariens Deluxe Track 28 snow thrower is constructed of steel and it features a deflector at the top of it so that the operator can easily control exactly where he is sending the expelled snow. Click Here to buy that Ariens Deluxe Track 28 Snow Blower.